This is a mega salad that has its roots in Sundanese cooking and has now become the typical street food of Jakarta in Indonesia. 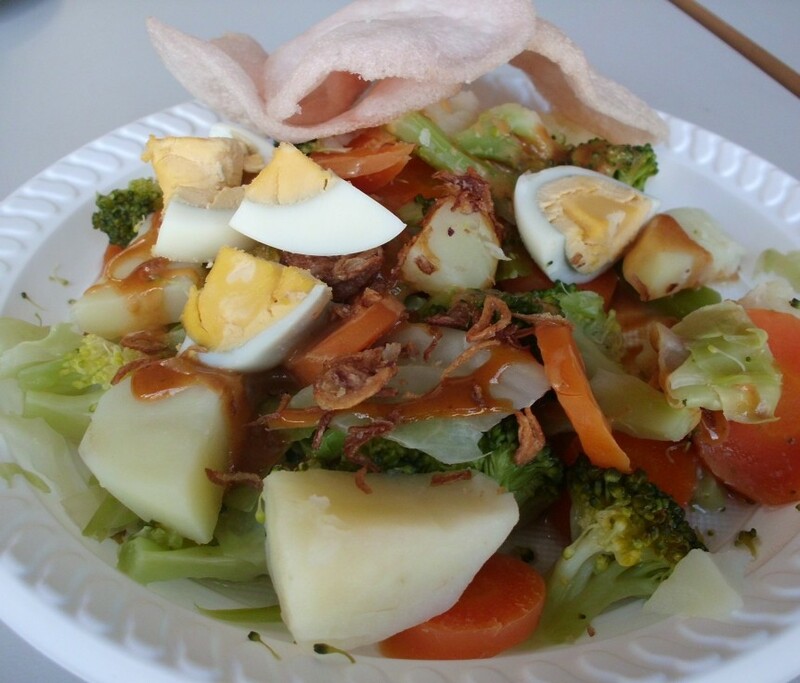 Gado-gado means medley or potpourri, which refers to all the different seasonal veggies and ingredients that are used, making it slightly different wherever you go and whatever the time of year. Tossed with the most incredible peanut dressing, which to be honest is more of a substantial sauce, and served with something crunchy on the side, such as prawn crackers, it’s a winning combination. Start by prepping all your salad ingredients. Scrub the potatoes and cook in boiling salted water for around 15 minutes, or until tender, then halve or slice up. Soft-boil the eggs for 6 minutes, or longer if you prefer them more cooked. Cut the tofu into 2½cm chunks and fry in a splash of sesame oil for around 15 minutes, or until golden, then sprinkle lightly with sea salt. Finely shred the cabbage if you want it raw or, if you’d rather cook it (which is traditional), cut it into 2cm slices, place in a colander and slowly pour a kettle of boiling water over the top. For me, this is the perfect amount of heat to soften the cabbage, but means you keep much of the delicious nutrients in there – feel free to apply this to any other seasonal greens you can find, too. Cut the tomatoes into wedges, quarter the radishes and slice the cucumber (I use my crinkle-cut knife – you should get one!). Season everything from a height with a little salt. Traditionally, you’d take a little bit of everything, put it into a bowl and pour the sauce over the top, which is a fine way to serve it. I like to do the reverse, because I feel that once you pour the sauce over you can’t see the care and attention that has gone into the preparation of the ingredients. So I spoon the sauce between four bowls, spread it up around the sides, then divide the ingredients around the bowls, taking a bit of pride in making them look nice. Pick over a few coriander leaves, add the prawn crackers and some finely sliced fresh chilli (if using), then show everyone what a celebration of food this is by getting them to toss together their very own portion.